The 7 and 7 Express, which use the Flushing Line through Midtown Manhattan, are colored purple. The IRT Flushing Line is a rapid transit route of the New York City Subway system, named for its eastern terminal in Flushing, Queens. It is operated as part of the A Division. The Interborough Rapid Transit Company (IRT), a private operator, had constructed the section of the line from Flushing, Queens, to Times Square, Manhattan between 1915 and 1928. A western extension was opened to Hudson Yards in western Manhattan in 2015, and the line now stretches from Flushing to Chelsea, Manhattan. It carries trains of the 7 local service, as well as the express <7> during rush hours in the peak direction. It is the only currently-operational A Division line to serve Queens. It is shown in the color purple on station signs, the official subway map, and internal route maps in R188 cars. Before the line was opened all the way to Flushing in 1928, it was known as the Corona Line or Woodside and Corona Line. Prior to the discontinuation of BMT services in 1949, the portion of the IRT Flushing Line between Times Square and Queensboro Plaza was known as the Queensboro Line. Since the mid-2010s, the line's signal system has been converted to an automated system. The Flushing Line has various styles of architecture, which range from steel girder elevated structures to European-style concrete viaducts. The underground stations have some unique designs as well. The designs include Hunters Point Avenue, which is in an Italianate style; Grand Central–42nd Street, which is a single round tube similar to a London Underground station; and 34th Street–Hudson Yards, which, with its deep vault and spacious interior, resembles a Washington Metro station. The line has two distinct sections, split by the Queensboro Plaza station. It begins as a three-track subway, with the center track used for express service, at Flushing–Main Street. It quickly leaves the ground onto a steel elevated structure above Roosevelt Avenue, passing Citi Field and the United States Tennis Association's National Tennis Center. A flying junction between Mets–Willets Point and 111th Street provides access to the Corona Yard from the local tracks. At 48th Street in Sunnyside, the line switches to Queens Boulevard and an ornate concrete viaduct begins. The express track ends between 33rd Street–Rawson Street and Queensboro Plaza. At Queensboro Plaza, the eastbound track (railroad north) is above the westbound track, with both tracks on the south side of the island platforms. On the north side of these platforms is the BMT Astoria Line. East of this point, both the Flushing Line and the Astoria Line were formerly operated by the IRT and the BMT. Connections still exist between the eastbound tracks just east of the platforms, but cannot be used for revenue service as BMT trains are wider than IRT trains. This is the only track connection between the Flushing Line and the rest of the subway system. West of Queensboro Plaza, the line sharply turns south onto an elevated structure over 23rd Street. It heads into the west end of Amtrak's Sunnyside Yard, and passes through two underground stations before entering Manhattan via the Steinway Tunnel under the East River. In Manhattan, the line runs under 42nd Street, with part directly underneath the 42nd Street Shuttle (S train), before angling towards 41st Street. 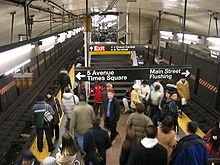 The Times Square–42nd Street station, with no track connections to other lines, is directly under 41st Street. West of Times Square, the tracks curve sharply downward before turning under 11th Avenue. The tracks end at 24th Street, even though the last station is at 34th Street. This segment was built as part of the extension of the Flushing Line west to Manhattan's Far West Side (see § Extension westward). A decommissioned lower level at the IND Eighth Avenue Line's 42nd Street–Port Authority Bus Terminal station formerly blocked the way. Although London ultimately received the bid for the 2012 Summer Olympics, New York City pursued the extension anyway, albeit as a means to enable the redevelopment of the far West Side under the Hudson Yards Redevelopment Project. 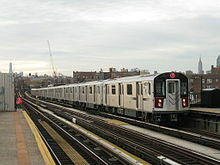 The Flushing Line is one of only two New York City non-shuttle subway lines that hosts only a single service and does not share operating trackage with any other line or service; the other is the BMT Canarsie Line, carrying the L train. Because of this, the MTA is automating the line with new trains using communication-based train control (CBTC), similar to the Canarsie Line (see § Automation of the line). The IRT Flushing Line's 7 service has the distinction of running trains with the largest number of cars in the New York City Subway. 7 trains are eleven cars long; most other New York City Subway services run ten or eight-car trains. The trains are not the longest by total length, however. An IND/BMT train of ten 60-foot (18 m)-long cars or eight 75-foot (23 m)-long cars, which is 600 feet (180 m) long, is still 35 feet (11 m) longer than an IRT train of eleven 51.4-foot (15.7 m)-long cars, which is 565 feet (172 m) long. For the history of the subway service, see 7 (New York City Subway service) § History. The earliest origins of the Flushing Line emerged on February 22, 1885, with the founding of the East River Tunnel Railroad. The railroad would construct the Steinway Tunnel under the East River, connecting the Long Island Rail Road in Queens with the New York Central Railroad in Manhattan. However, the East River Tunnel Railroad Company went defunct. On July 22, 1887, Walter S. Gurnee and Malcolm W. Niven founded the New York and Long Island Railroad Company (NY&LIRR). They soon began planning for the tunnel. To run from West 42nd Street and Tenth Avenue to Van Alst Avenue after crossing under the East River, the builders planned for the remainder of the line to be constructed on private lands, and numerous alterations were made to the proposal. In 1890, William Steinway advised the company to utilize electricity to power the tunnels, believing that the construction of the tunnel would increase the value of his properties in the vicinity. On June 3, 1892, construction of the tunnel commenced near the intersection of 50th Avenue and Vernon and Jackson Avenues. :164 However, several failures and hindrances, which included an underground spring preventing the extraction of rubble, resulted in the termination of the project on February 2, 1893.:165 Several calls for the resumption of the project between 1893 and 1896, in addition to a proposed extension to New Jersey, were futile. The tunnel opened for subway use on June 22, 1915, with service running between Grand Central and Vernon–Jackson Avenues. The Flushing Line was extended one stop from Vernon–Jackson Avenues to Hunters Point Avenue on February 15, 1916. On November 5, 1916, the Flushing Line was extended two more stops to the east to the Queensboro Plaza station. At this point, the Flushing Line between Grand Central and Queensboro Plaza was called the Queensboro Line. The line was opened from Queensboro Plaza to Alburtis Avenue on April 21, 1917. By June 1917 ridership on the line was exceeding expectations, with 363,726 passengers using the Corona Line that month, 126,100 using the Queensboro Plaza station, and 363,508 using the Queensboro Subway. BMT shuttles began to use the Flushing and Astoria Lines on April 8, 1923. Service to 111th Street was inaugurated on October 13, 1925, with shuttle service running between 111th Street and the previous terminal at Alburtis Avenue (now 103rd Street–Corona Plaza) on the Manhattan-bound track. The line to Main Street had been practically completed at this point, but had to be rebuilt in part due to the sinking of the foundations of the structure in the vicinity of Flushing Creek. Once the structure was deemed to be safe for operation, the line was extended to Willets Point Boulevard on May 7, 1927.:13 This extension was served by shuttle trains until through service was inaugurated on May 14. On that date, the opening of the station was formally celebrated; it coincided with the opening of the Roosevelt Avenue Bridge for cars and buses. For the 1939 New York World's Fair, the Willets Point Boulevard station was rebuilt and centered on 123rd Street, just west of where the station originally lay. Some remnants of the old station are still visible; ironwork tends to indicate where the older outside-platform stations were, and the remains of the fare entry area can be seen east of the current station. The original Willets Point Boulevard station was a "minor" stop on the Flushing Line; it had only two stairways and short station canopies at platform level. It was rebuilt into the much larger station in use today, and the ramp used during two World's Fairs still exists, but is only used during special events, such as the US Open for tennis. Express service to the World's Fair began on the Flushing Line on April 24, 1939. Currently and historically, the IRT assigned the number 7 to its Flushing Line subway service, though this did not appear on any equipment until the introduction of the R12 rolling stock in 1948. The BMT assigned the number 9 to its service, used on maps but not signed on trains. The Main Street station was not intended to be the Flushing Line's terminus. :49 While the controversy over an elevated line in Flushing was ongoing in January 1913, the Whitestone Improvement Association pushed for an elevated to Whitestone, College Point, and Bayside. However, some members of that group wanted to oppose the Flushing line's construction if there was not going to be an extension to Whitestone. In January 1913, groups representing communities in south Flushing collaborated to push for an elevated along what was then the LIRR's Central Branch,:53–55 in the current right-of-way of Kissena Corridor Park. :277 Shortly after, the New York Public Service Commission (PSC) announced its intent to extend the line as an el from Corona to Flushing, with a possible further extension to Little Neck Bay in Bayside. :56 There was consensus that the line should not abruptly end in Corona, but even with the 5.5-mile-long (8.9 km) extension to Bayside, the borough would still have fewer Dual Contracts route mileage than either Brooklyn or the Bronx. The New York Times wrote that compared to the Bronx, Queens would have far less subway mileage per capita even with the Flushing extension. 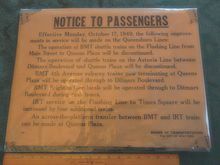 On October 17, 1949, the joint BMT/IRT service arrangement ended. The Flushing Line became the responsibility of IRT. The Astoria Line had its platforms shaved back, and became BMT-only. Because of this, routes through the then eight-track Queensboro Plaza station were consolidated and the northern half of the structure was later torn down. Evidence of where the torn-down platforms were, as well as the trackways that approached this area, can still be seen in the ironwork at the station. During the joint service period, the elevated stations on the Astoria and Flushing Lines were only able to fit nine 51-foot-long IRT cars, or seven 60-foot-long BMT cars. After the BMT/IRT dual services ended in 1949, the New York City Board of Transportation announced that the Flushing Line platforms would be lengthened to 11 IRT car lengths, and the Astoria Line platforms extended to 10 BMT car lengths. The project, to start in 1950, would cost $3.85 million. Identification of Trains and Routing Automatically (IDENTRA) was implemented on the line in the 1957 and used until 1997, when a route selector punch box with B1 Astoria, local/express buttons was installed at the 10/11 car marker on the upper level of Queensboro Plaza. IDENTRA used a removable round circular disc type radio antenna assembly, slide-mounted on the small mounting brackets that were attached on the front of R12, R14, R15, and R17 cars that were assigned to the 7 route, which had been used on the line since 1948. Similar to the use of radio transponders in the CBTC installation, the system used the antennas to determine whether a train was running local or express, and then accordingly switched the track at interlockings near the Queensboro Plaza and Flushing–Main Street stations. This move reduced the number of signal towers on the line from 9 to 2 and theoretically allowed to operate 37 eleven-car trains instead of only 30 nine-car trains per hour. The consolidated signal system was in use by 1956 while the selector system was in service by 1958. However, in practice, train frequencies were not necessarily increased. According to an experiment performed by the Long Island Star Journal in 1957, rush-hour headways ranged from 6 to 15 minutes between local trains, and 2 to 6 minutes between express trains. Rolling stock along the Flushing Line received "strip maps" in 1965, the first such installation in the system. The strip maps showed only the stations on the Flushing Line, as opposed to for the entire system, but the transfers available at each station were listed. As with much of the rest of the subway system, the IRT Flushing Line was allowed to deteriorate throughout the 1970s to the late 1980s. Structural defects that required immediate attention at the time were labeled as "Code Red" defects or "Red Tag" areas, and were numerous on the Flushing Line. Some columns that supported elevated structures on the Flushing Line were so shaky that trains did not run when the wind speed exceeded 65 miles per hour (105 km/h). This was particularly widespread on the Flushing and the BMT Jamaica Lines. On May 13, 1985, a 4​1⁄2-year long project, $70 million project to overhaul the IRT Flushing Line commenced. It forced single-tracking on much of the line during weekends, and the elimination of express service for the duration of the project. The MTA advertised this change by putting leaflets in the New York Times, the Staten Island Advance, the Daily News, and Newsday. The project laid new track, replaced or repaired concrete and steel structures, replaced wooden station canopies with aluminum, improved lighting, improved signage, and installed new ventilation and pumping equipment. Expanded service was provided when the Mets played home games or when there were sporting events in Flushing Meadows–Corona Park. Paradoxically, Flushing local trains had better on-time performance during the construction than before it started. The $60 million rehabilitation project on the Queens Boulevard concrete viaduct was completed six months early, and <7> express service was restored on August 21, 1989, without stopping at 61st Street–Woodside. :17 This led to protests by community members to get express service back at 61st Street station. The reason for the discontinuance on the Flushing express was because the MTA felt it took too long to transfer between locals and expresses. The service was also due to fears of delays on the line when locals and expresses merged after 33rd Street–Rawson Street. The change was supposed to enable local trains to stop at 61st Street every four minutes (15 trains per hour) during rush hours, but according to riders, the trains arrived every 8–10 minutes. The community opposition led to service changes, and expresses began stopping at Woodside again a few months later. On weekends between January 19 and March 11, 7 service was partially shutdown so that switches at the Fisk Interlocking could be replaced. The $5 million project was not done in conjunction with the work between 1985 and 1989 because the 23-year old switches were not due for replacement. In the mid-1990s, the MTA discovered that the Queens Boulevard viaduct structure was unstable, as rocks that were used to support the tracks as ballast became loose due to poor drainage, which, in turn, affected the integrity of the concrete structure overall. <7> express service was suspended again between 61st Street–Woodside and Queensboro Plaza; temporary platforms were installed to access the express track in the four intermediate stations. The work began on April 5, 1993. When the viaduct reconstruction finished on March 31, 1997, full <7> express service was reinstated. Throughout this entire period, ridership grew steadily. In spring 2018, express service west of 74th Street was suspended temporarily so the MTA could fix the supports under the center track at 61st Street. In January 2012, the MTA selected Thales for a $343 million contract to set up a communications-based train control (CBTC) system as part of the plan to automate the line. This was the second installation of CBTC, following a successful implementation on the BMT Canarsie Line. The total cost was $550 million for the signals and other trackside infrastructure, and $613.7 million for CBTC-compliant rolling stock. The safety assessment at system level was performed using the formal method Event-B. The MTA chose the Flushing Line for the next implementation of CBTC because it is also a self-contained line with no direct connections to other subway lines currently in use. Funding was allocated in the 2010–2014 capital budget for CBTC installation on the Flushing Line, with scheduled installation completion in 2016. The R188 cars were ordered so the line would have compatible rolling stock. CBTC on the line will allow the 7 and <7>​ services to run 7% more service, or 2 more trains per hour (tph) during peak hours (before retrofit, it ran 27 tph). However, the system had been retrofitted to operate at 33 tph even without CBTC. The first train of R188 cars began operating in passenger service on November 9, 2013. Test runs of R188s in automated mode started in late 2014. However, the CBTC retrofit date was later pushed back to 2017 or 2018 after a series of problems that workers encountered during installation, including problems with the R188s. The project also went over budget, costing $405 million for a plan originally marked at $265.6 million. The whole line was cutover to CBTC operation on November 26, 2018, with the completion of the segment from Hudson Yards to the north of Grand Central. Completely independent of the CBTC installation is the 7 Subway Extension (see below), which features both CBTC signals and fixed-block signaling. The extension will also increase line capacity. The long blocks along the avenues make the walk as long as 20 minutes to the westernmost parts of the area. In addition, there is no convenient link from Grand Central Station or elsewhere on the east side of Manhattan, making the Far West Side a difficult commute for workers from parts of Manhattan, Queens, Westchester and Connecticut. An extension of the Flushing Line was then proposed as part of the New York City bid for the 2012 Summer Olympics. The City wanted to get funding before July 2005, at which time the International Olympic Committee would vote on funding, but due to budget shortfalls, the MTA could not pay to fund the extension. After New York City lost their Olympic bid, the government of New York City devised a rezoning plan for the Hudson Yards area and proposed two new subway stations to serve that area. The subway extension was approved following the successful rezoning of about 60 blocks from 28th to 43rd Streets, which became the Hudson Yards neighborhood. In October 2007, the MTA awarded a $1.145 billion contract to build an extension from Times Square to Hudson Yards. There is one new station at 34th Street and Eleventh Avenue to serve Hudson Yards, but in the MTA's original plans, there was another station proposed at 10th Avenue and 41st Street. The 10th Avenue station was eliminated due to lack of funding. The extension's opening was delayed several times due to issues in installing the custom-made incline elevators for the 34th Street station. The extension eventually opened on September 13, 2015. The 34th Street–Hudson Yards station's design has been compared to that of Washington Metro stations, or to those of stations along London's Jubilee Line Extension. Q47 bus to LaGuardia Airport (Marine Air Terminal only). ^ Only the Flushing-bound local side platform is wheelchair-accessible. Trains operate on this platform only during New York Mets games and other special events. ^ "Average Weekday Subway Ridership". Metropolitan Transportation Authority. Archived from the original on March 28, 2014. Retrieved April 2, 2014. ^ a b "Flushing Line 2016 Town Hall April 5, 2016 Sunnyside, Queens" (PDF). Access Queens. Metropolitan Transportation Authority. April 5, 2016. Retrieved October 22, 2017. ^ a b Tangel, Andrew (September 13, 2015). "New Subway Station Opens on NYC's Far West Side". Wall Street Journal. Retrieved September 13, 2015. ^ Mindlin, Alex (April 20, 2008). "No Whoosh, No 'All Aboard'". The New York Times. Retrieved February 28, 2010. ^ a b c d Mitchell L. Moss (November 2011). "HOW NEW YORK CITY WON THE OLYMPICS" (PDF). Rudin Center for Transportation Policy and Management, Robert F. Wagner Graduate School of Public Service. New York University. Retrieved September 11, 2015. ^ a b c d Rogoff, David (1960). "The Steinway Tunnels". Electric Railroads (29). ^ a b Hood, Clifton (2004). 722 Miles: The Building of the Subways and How They Transformed New York (Centennial ed.). Baltimore: Johns Hopkins University Press. pp. 163–168. ISBN 978-0-8018-8054-4. Retrieved August 26, 2009. ^ Feinman, Mark S.; Darlington, Peggy; Pirmann, David. "IRT Flushing Line". www.nycsubway.org. www.nycsubway.org. Retrieved April 21, 2013. ^ a b c "Queensboro Tunnel Officially Opened — Subway, Started Twenty-Three Years Ago, Links Grand Central and Long Island City — Speeches Made in Station — Belmont, Shonts, and Connolly Among Those Making Addresses — $10,000,000 Outlay" (PDF). New York Times. June 23, 1915. p. 22. Retrieved October 2, 2011. ^ a b "Subway Extension Open - Many Use New Hunters Point Avenue Station" (PDF). New York Times. February 16, 1916. p. 22. Retrieved August 31, 2016. ^ a b Senate, New York (State) Legislature (January 1, 1917). Documents of the Senate of the State of New York. ^ a b c "Annual report — 1916-1917". Interborough Rapid Transit Company. December 12, 2013. hdl:2027/mdp.39015016416920. ^ a b c "New Subway Link" (PDF). New York Times. November 5, 1916. p. XX4. Retrieved October 2, 2011. ^ Minutes and Proceedings. New York City Transit Authority. January 1, 1955. ^ a b Annual Report. J.B. Lyon Company. 1928. ^ Cunningham, Joseph; DeHart, Leonard O. (1993). A History of the New York City Subway System. J. Schmidt, R. Giglio, and K. Lang. p. 48. ^ a b c d e f g h i j k l "Transit Service on Corona Extension of Dual Subway System Opened to the Public" (PDF). New York Times. April 22, 1917. p. RE1. Retrieved October 2, 2011. ^ "Additional Subway Service to Borough of Queens". New York Times. April 8, 1923. p. RE1. ^ a b "First Trains to be Run on Flushing Tube Line Oct. 13: Shuttle Operation Ordered to 111th Street Station on New Extension". Newspapers.com. Brooklyn Daily Eagle. October 5, 1925. p. 8. Retrieved September 20, 2015. ^ a b Poor's...1925. 1925. p. 523. ^ "Flushing Rejoices as Subway Opens" (PDF). New York Times. January 22, 1928. p. 28. Retrieved October 2, 2011. ^ "Corona Subway Extended" (PDF). New York Times. May 8, 1927. p. 26. Retrieved October 2, 2011. ^ a b Annual Report. J.B. Lyon Company. 1927. ^ "Flushing to Celebrate" (PDF). New York Times. May 13, 1927. p. 8. Retrieved October 2, 2011. ^ "Dual Queens Celebration" (PDF). New York Times. May 15, 1927. p. 3. Retrieved October 2, 2011. ^ a b "Fifth Av. Station of Subway Opened" (PDF). New York Times. March 23, 1926. p. 29. Retrieved October 2, 2011. ^ Annual Report For the Year Ended June 20, 1925. Interborough Rapid Transit Company. 1925. 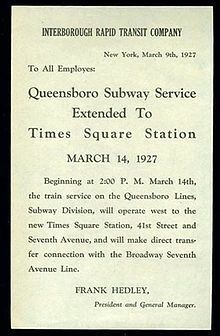 ^ a b "New Queens Subway Opened to Times Sq" (PDF). New York Times. March 15, 1927. p. 1. Retrieved October 2, 2011. ^ "Flushing Rejoices as Subway Opens – Service by B.M.T. and I.R.T. Begins as Soon as Official Train Makes First Run – Hope of 25 Years Realized – Pageant of Transportation Led by Indian and His Pony Marks the Celebration – Hedley Talks of Fare Rise – Transit Modes Depicted" (PDF). The New York Times. January 22, 1928. Retrieved September 18, 2015. ^ Annual Report for the Year Ending June 30, 1927. Interborough Rapid Transit Company. 1927. ^ "Fast Subway Service to Fair Is Opened" (PDF). New York Times. April 25, 1939. p. 1. Retrieved October 2, 2011. ^ Korman, Joseph (December 29, 2016). "Line Names". www.thejoekorner.com. Retrieved April 29, 2018. ^ a b c d e f g h i j k l m n o p q r s t u Raskin, Joseph B. (2013). The Routes Not Taken: A Trip Through New York City's Unbuilt Subway System. New York, New York: Fordham University Press. ISBN 978-0-82325-369-2. 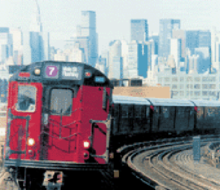 ^ "Flushing Line Risk Put on the City – Interborough Agrees to Equip and Operate Main St. Branch, but Won't Face a Loss – It May Be a Precedent – Company's Letter Thought to Outline Its Policy Toward Future Extensions of Existing Lines" (PDF). The New York Times. December 4, 1913. Retrieved September 18, 2015. ^ "200 TAKE LAST RIDE ON 2D AVE. ELEVATED; Official Says the Structure Will Yield 29,400 Tons of Steel". The New York Times. June 14, 1942. ISSN 0362-4331. Retrieved April 29, 2018. ^ "EL' WILL CEASE SATURDAY; Service on Second Avenue Line From Queens to End". The New York Times. June 7, 1942. ISSN 0362-4331. Retrieved April 29, 2018. ^ a b Sparberg, Andrew J. (2014). From a Nickel to a Token: The Journey from Board of Transportation to MTA. Empire State Editions. ISBN 9780823261932. ^ Bennett, Charles G. (November 20, 1949). "TRANSIT PLATFORMS ON LINES IN QUEENS TO BE LENGTHENED; $3,850,000 Program Outlined for Next Year to Care for Borough's Rapid Growth NEW LINKS ARE TO BE BUILT 400 More Buses to Roll Also -- Bulk of Work to Be on Corona-Flushing Route TRANSIT PROGRAM IN QUEENS OUTLINED". The New York Times. ISSN 0362-4331. Retrieved April 29, 2018. ^ a b c d e "Moving Forward: Accelerating the Transition to Communications-Based Train Control for New York City's Subways" (PDF). rpa.org. Regional Plan Association. May 2014. Retrieved September 12, 2016. ^ "Automatic Control of Switches In New York Subway". Railway Signaling and Communications (4): 33. 1954. ^ a b Perlow, Austin H. (April 2, 1957). "Millions Spent... Flushing IRT Still Crawls" (PDF). Long Island Star – Journal. p. 1. Retrieved October 7, 2018 – via Fulton History. ^ a b Annual Report — 1962–1963. New York City Transit Authority. 1963. ^ Ingalls, Leonard (August 28, 1953). "2 Subway Lines to Add Cars, Another to Speed Up Service; 3 SUBWAYS TO GET IMPROVED SERVICE". The New York Times. ISSN 0362-4331. Retrieved April 29, 2018. ^ "R17s to the Flushing Line". New York Division Bulletin. Electric Railroaders' Association. 5 (6): M-8. December 1962 – via Issu. ^ "TA to Show Fair Train". Long Island Star – Journal. August 31, 1963. Retrieved August 30, 2016 – via Fulton History. ^ Perlmutter, Emanuel (April 14, 1965). "Subway Cars Here To Get Strip Maps Showing One Route; New Series of Maps, Signs and Schedules Are Designed to Take the Guesswork Out of Subway Travel" (PDF). New York Times. ISSN 0362-4331. Retrieved August 16, 2016. ^ a b Slagle, Alton (December 2, 1990). "More delays ahead for No. 7 line". New York Daily News. Retrieved November 5, 2018. ^ Annual Report on ... Rapid Routes Schedules and Service Planning. New York City Transit Authority. 1989. ^ Feinman, Mark S. "The New York Transit Authority in the 1980s". www.nycsubway.org. Retrieved November 8, 2016. ^ Pérez-Peńa, Richard (October 9, 1995). "Along the Subway, a Feat in Concrete". The New York Times. Retrieved May 15, 2009. ^ "April 1993 Map Information". Flickr. New York City Transit Authority. April 1993. Retrieved October 7, 2018. ^ "The repairs we're making on the 7 line will take some time. Like 3-4 minutes per trip if you ride the express". New York Daily News. April 2, 1993. Retrieved November 5, 2018. ^ "7 Express service is being restored between 61 Street/Woodside and Queensboro Plaza". New York Daily News. March 28, 1997. Retrieved November 5, 2018. ^ Onishi, Norimitsu (February 16, 1997). "On the No. 7 Subway Line in Queens, It's an Underground United Nations". The New York Times. Retrieved May 15, 2009. ^ Rivoli, Dan (January 12, 2018). "No. 7 line losing express service for weeks in Queens". NY Daily News. Retrieved January 17, 2018. ^ Guéry, Jérôme; Reque, Antoine; Burdy, Lilian; Sabatier, Denis (2012). Formal Proofs for the NYCT Line 7 (Flushing) Modernization Project. Abstract State Machines, Alloy, B, VDM, and Z. Lecture Notes in Computer Science. 7316. pp. 369–372. doi:10.1007/978-3-642-30885-7_34. ISBN 978-3-642-30884-0. ISSN 0302-9743. ^ "MTA | Capital Programs Service Reliability". web.mta.info. Metropolitan Transportation Authority. Retrieved September 3, 2017. ^ Parkinson, Tom; Fisher, Ian (1996). Rail Transit Capacity. ISBN 9780309057189. Retrieved May 20, 2014. ^ Mann, Ted. "MTA Tests New Subway Trains on Flushing Line". The Wall Street Journal. Retrieved November 19, 2013. ^ "MTA - New Subway Cars Being Put to the Test". mta.info. ^ a b c Barone, Vincent (August 21, 2017). "7 train signal upgrade on track for 2017: MTA". am New York. Retrieved August 23, 2017. ^ a b Santora, Marc; Tarbell, Elizabeth (August 21, 2017). "Fixing the Subway Requires Pain. But How Much, and for How Long?". The New York Times. ISSN 0362-4331. Retrieved August 23, 2017. ^ "Capital Program Oversight Committee Meeting November 2018" (PDF). mta.info. Metropolitan Transportation Authority. November 2018. Retrieved November 26, 2018. ^ a b Preparing for the Future: A Commercial Development Strategy for New York City : Final Report. Group of 35. 2001. p. 56. Retrieved September 12, 2015. ^ "No. 7 Subway Extension". Hudson Yards Development Corporation. Retrieved July 3, 2013. ^ Dobnik, Verena (February 7, 2013). "NYC Transit Projects: East Side Access, Second Avenue Subway, and 7 Train Extension". Huffington Post. Huffington Post. Retrieved July 24, 2013. ^ "New York Comes in a Disappointing Fourth Place". WNYC. July 6, 2005. Retrieved September 12, 2015. ^ "NO. 7 SUBWAY EXTENSION-HUDSON YARDS REZONING AND DEVELOPMENT PROGRAM" (PDF). nyc.gov. Archived from the original (PDF) on March 4, 2016. Retrieved September 26, 2015. ^ Purnick, Joyce (January 2, 2005). "What Rises in the West? Uncertainty". The New York Times. Retrieved March 6, 2010. ^ a b "Transit Board Approves Funding For 7 Line Extension". NY1. October 25, 2007. Archived from the original on March 25, 2008. Retrieved February 28, 2010. ^ "Top New York Projects" (PDF). New York Construction. June 2008. p. 27. Archived from the original (PDF) on July 8, 2011. Retrieved February 28, 2010. ^ "Mayor Bloomberg and Governor Spitzer Announce Start of Construction on #7 Subway Extension" (Press release). New York City Mayor's Office. December 3, 2007. Retrieved February 28, 2010. ^ "MTA's 7 Line Extension Project Pushed Back Six Months". NY1. June 5, 2012. Archived from the original on July 11, 2012. Retrieved June 5, 2012. ^ Cuozzo, Steve (June 5, 2012). "No. 7 Train 6 Mos. Late". New York Post. Retrieved June 5, 2012. ^ Fitzsimmons, Emma G. (March 24, 2015). "More Delays for No. 7 Subway Line Extension". New York Times. Retrieved March 29, 2015. ^ "Various Visions of the Future in NYC's First New Subway Station in 25 Years". Hyperallergic. September 15, 2015. Retrieved September 17, 2015. ^ "A Tour of NYC's Newest Subway Station With Its Architect". Curbed NY. September 21, 2015. Retrieved September 24, 2015. ^ Coen, Amanda (January 19, 2012). "New York City's 7 Line Extension is Ahead of Schedule & Under Budget". Inhabitat. Retrieved May 13, 2014. ^ a b c d e f g h i j k l m n o p q r s t "MTA/New York City Transit Subway Line Information". mta.info. Metropolitan Transportation Authority. Retrieved April 21, 2013. ^ a b "Flushing Line Opens Jan. 21" (PDF). New York Times. January 12, 1928. p. 12. Retrieved October 2, 2011. See also: "Flushing Extension of Corona Subway Ready to Open" (PDF). New York Times. January 8, 1928. p. 189. Retrieved October 2, 2011. ^ "Mets — Willets Point Station: Accessibility on Game Days and Special Events Only". Metropolitan Transportation Authority. Archived from the original on April 22, 2009. Retrieved May 15, 2009. ^ "7 Line Extension". mta.info. Metropolitan Transportation Authority. ^ Fitzsimmons, Emma G. (September 10, 2015). "Subway Station for 7 Line Opens on Far West Side". New York Times. Retrieved September 13, 2015. Wikimedia Commons has media related to IRT Flushing Line.